we work currently only with gold, in all colors and alloys. 750 / (18k) is best-selling yellow gold alloy. It has a saturated deep color and exceptional glance. The higher the fine gold content, the more valuable is the wedding or engagement ring. 585 / (14k) is not only a cheaper alternative to 750 / (18k), but due to the lower percentage of gold it is harder than 750 / (18k) and it is harder to be scratched. So if you are looking for a traditional wedding or engagement ring made of gold, which best fits to your daily and professional life, then the 585 / (14k) is the right alloy for you. White gold is currently our most favorite gold alloy. White gold is used in the jewellery because it looks very similar to platinum, but it is still significantly cheaper. we use white gold as usual in alloys 585 and 750. Unfortunately, Mother Nature has provided no pure white gold at all. To obtain the white color, the fine pure gold is melted with white metals such as palladium, manganese and silver. If you still want to receive the characteristic silvery light gray tone of the white gold, the wedding or engagement rings should be rhodium-plated, which means they will be coated with the precious metal rhodium. This coating leads in the desired color result, but it will be out over time. 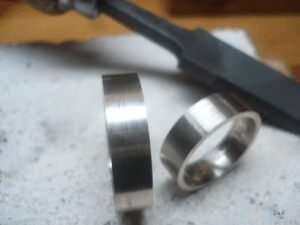 Because of the color result, we talk in this case about rhodium-plated rings made of white gold and in the case of rings without rhodium plating we speak about grey gold. we recommend the “gray gold” which is not rhodium-plated. This is a particularly high-quality alloy that is indeed darker than “white gold”, but it doesn’t change its color over long time. In the picture above a pair gray gold wedding rings are shown. This is the color that appears after the melting and it remains the same forever. 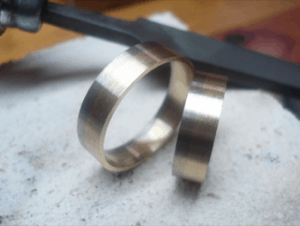 If the customer does not clearly order “gray gold”, the rings will be rhodium-plated! The multicolored wedding rings are processed with high quality. They consist of two or more gold shares. These gold shares are separately cast and forged and then mated and soldered. It is a precise goldsmith art that consumes really a lot of time. Unfortunately, you can find on the market a lot of Asian mass-produced rings. They look decent, but they are made only of yellow gold (if you get lucky at all and don’t buy a fake). Instead of white gold they use a layer of rhodium that is applied galvanically. 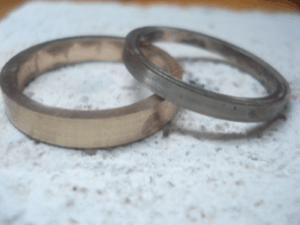 But it wears off over time and the result is a corresponding discoloration of the rings. Watch always at the inner side of the ring! If you recognize only one color, in 99% of cases the rings belong to cheap mass-produced rings from Asia, which definitely will lose their glance and glory just within a year! Surround of diamonds is the pinnacle of the goldsmith’s art, which requires a lot of tact. Working with a microscope and GraverMax GRS tools guarantees accurate implementation of all complex setting techniques. GraverMax are the market leader and the best tools so with their help that We could achieve the highest quality results. What should you know about wedding/engagement rings how they get older? Well, of course our experience and use of the latest goldsmith technologies can’t prevent the rings completely from signs of usage. Gold and platinum remain compared to iron and glass relatively soft metals. Traces of usage arise from the very first day when you touch objects with your palm. 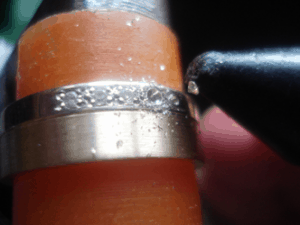 Nevertheless, we use only high quality gold alloys for all our rings and the way we use it guaranties that the scratches are less deep even after longer time. But in principle there is absolutely no technology for gold processing that helps signs of usage to be avoided. Of course each wedding/engagement ring can be renovated by goldsmith like us in order to look like a new one.